Yeah, after midnight I usually let it all "hang down"....meaning my head dropped down to my belly while I drool all over myself. A good friend of mine once commented that I look like I'd been shot sitting in my chair, still holding a firm grip on my beer! 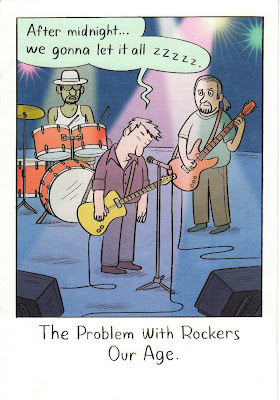 Lady Allwinky found the above Birthday Card both amusing and appropriate for my 52nd Birthday and refusal to quit being an "Ole Rocker"! Sir Hook's Traveling Medicine Show found its way back to the Sacred Grounds of downtown St. Louis and Busch Stadium for a Birthday/Memorial Weekend of Baseball, Beer, Italian Food and the Blues! I'll spare you the usual rant on the Cardinals (who won both games we attended with the score of 5-0), paying homage to my Dad's brick at the main gate by the statue of Stan the Man, etc. OK, I guess I had to sneak it in! After taking in the second win on my birthday, we headed up to Charlie Gitto's on the Hill for authentic "Mangia Mangia" time and then back downtown to Beale Street on Broadway. The name says it all! Beale Street on Broadway is a hole in the wall gem of Blues music, set to an outdoor listening venue complete with Tom Sawyer river hut stage, and beer bottle lights hanging from the beams down the bar. Usually on most weekends you'll catch local Blues legend, David Dee and the Hot Tracks. David, in his golden jump suit, Stevie Ray Vaughn hat, and diamond studded belt buckle that spells his name....warms up for the main act. David, who is pushing 70, can play the blues with one hand tied behind his back! Being a lefty, like Hendrix, he doesn't use a pick, but caresses the guitar with his long lanky fingers, or slaps it with his hand like a nun whipping the bad boy Gibson Flying V guitar. I always tell people that playing guitar is like making love to your woman. It has nice curves, a long neck and I get to put my fingers all over it...and if you're really good, it will scream for you! David Dee knows what I'm talking about! One of his songs talks about how, "I ain't been fishing lately...but my hook is still good." Of course, Sir Hook showed his appreciation for that line! After David left us dripping in the midnight sun...along came the main act...Magic Slim and the Tear Drops out of Chicago. Magic Slim is 72 years old. Wearing a hat inspired by Bo Didley, playing a Les Paul (unusual for a Blues master), not being too slim, but playing every bit as inspired as his Chicago brother Buddy Guy...Magic Slim and the Tear Drops proved that After Midnight the Ole Man can still play the game! Well after midnight...we head back to our room at the Hilton Ballpark on Broadway and take the elevator to the 19th floor. I always love this elevator, because it has two mirrors on the side, so you get the infinity thing going on. How many Hooks can you handle?! Our room was 1926. We found that interesting, in that both our father's were born in 1926, they both pitched for the Navy and both were signed by the majors...mine with the Cardinals and Lady Allwinky's with the Brooklyn Dodgers. Play Ball!!! This is the view of the stadium from our window. The grounds crew were still working on the field getting ready for the Sunday afternoon game. After a late breakfast and Mass at St. Louis the King Basilica, we took the short stroll to the Arch, the Gateway to the West. This is at least my 100th time to stand here, but it is still inspiring to my spirit. I remember going to the ballgames with my dad in the early 60's and watching this slowly being erected in the sky. I leave St. Louis satisfied and ready to drool on myself the next day. thanks for sharing your birthday with us! Still I can imagine Hooky its your ideal city..with the baseball park so close to the downtown bars and restuarant.